A bird of both lowland and foothill forests, this species is seen moving through low vegetation near the ground, usually in pairs. 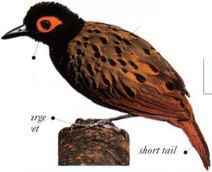 It often accompanies army ant swarms to feed on insects flushed out by the ants and can be seen clinging to vertical stems in the manner typical of all antbird species. • NEST A bulky cup, hidden close to ground level in thick vegetation.